A post-post-apocalyptic world where fantasy and science fiction collide, Thunderstone is the far future of Wesnoth's world Irdya. 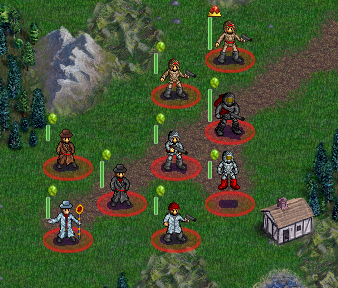 The core of the Thunderstone add-on is an era, consisting of five all-new factions - Human Troopers, Elvish Mystics, Dwarvish Guardians, Orcish Raiders, and Shaxthals. The add-on also introduces new terrains, the electric damage type, new weaponry and a new attack range, vehicles, and special units. Altogether, Thunderstone hopes to be the core for scenarios and campaigns set in the far future of the world of Wesnoth. 4.1 Major Release Roadmap: What is needed for...? Thunderstone introduces new sets of terrain on top of the traditional Wesnoth terrains. The two major terrain sets are Uninhabited and Space. Space is the void between the heavenly bodies. Only spacecraft, robotic or semi-robotic creatures that do not need to breathe oxygen, and creatures shielded and given oxygen with a specialized suit can travel through space. Uninhabited is a similar environment except on a planet or moon, one hostile to most living creatures. The major difference is that only fliers can travel in Space while any machine small enough to enter the atmosphere (all except the biggest spaceships) can travel on or directly above Uninhabited terrain. Thunderstone also introduces a new damage type called "Electric." Electric is similar to fire, but is usually produced from high-tech weapons. Electric's main specialty is that it does extra damage against high-tech machinery such as vehicles, thus making it an effective counter for otherwise powerful units. Thunderstone introduces many new weapons of a higher technology level than standard Wesnoth, including guns. It also introduces a new attack range, long ranged, that is mostly used in spaceships and other weaponry capable of much higher range than bows or most guns, such as sniper rifles. Because of long ranged's rarity, it usually provides no retaliation to the attacker which is a key strategic advantage. Guns are portable machines that shoot projectiles at people and have replaced the bow as the ranged weapons of choice. Thunderstone is the dawn of the space-traveling age for the sentient races of Irdya, so guns vary from bullets to bursts of harmful electricity. Unlike bows, the rapid-fire capability of guns enables many guns span two ranges. For example, a shotgun is able to be used in both melee in ranged. Other guns can be used as blunt objects close up to still do melee damage. All standard guns that can be shot in melee have the first strike ability there, while those that are not shot do not have first strike. Despite the abandonment of the bow for the gun, some close-ranged weapons are still used. These varied objects are not necessarily disadvantaged because they are usually unanticipated. Most factions in Thunderstone will have several vehicles. Vehicles typically are so powerful and expensive that they are usually recruited at level 2 or higher. Vehicles are not living and thus have the mechanical trait (unpoisonable, undrainable, and unplaugeable). Vehicles can be flying or ground-based, and tend to be stronger than infantry. Their superiority comes with major weaknesses: electric-based attacks, and high prices and upkeep. In addition to the recruitable flying vehicles, there are also unrecruitable spaceships that are much stronger, but can only travel in space terrain. These units are non-standard and much rarer than the normal vehicles. Draft sprites of some Human Troopers. Humans are still the jack-of-all-trades race. Balancing magic and science, humans are generalists who adapt to novelty more effectively than the other races of Irdya. Their technical strength area is computers and miniaturization. They, more than the other speaking peoples, tend to win by luring opponents into fatal mistakes. Elves are still in touch with nature and in the years of peace they have greatly enhanced their magical skills. Elves focus heavily on this magic, rejecting technologies which they find disharmonious, and excel at biology and medicine. Much of their technology is magically-enhanced. Tactically, elves focus on mobility and precision fire. The dwarves are the master technologists and builders of Irdya, especially in the areas of power, weapons, propulsion, and large-scale engineering. They remain intensely conservative, and their technology is ultra-reliable even if it lacks the finesse and efficiency of human or elven work. Orcs have stolen most of what they have from the more civilized species, but focus mostly on war. Their technology tends towards the crude, overpowered hack, and is notoriously (and sometimes comically) unreliable. The flip side of this is that in any environment that doesn't outright kill them, orcs are less helpless without their tech than the other speaking peoples. The Shaxthals are an ancient race created by the original inhabitants of Irdya. These combinations of bioengineering and magic were made to aid in a war, but they soon became out-of-control. They were defeated, however, and only revived recently under the Chaos Empire. When the Chaos Empire was destroyed, the Shaxthals became free to do what they do best - kill. Thunderstone Era will be the core add-on for the Thunderstone project and will provide the units, terrain, and other files necessary for every other Thunderstone-based add-on. This will be the only add-on necessary to play normal multiplayer. Thunderstone Trilogy will focus on the main Thunderstone plot arc, and is designed to be the main set of campaigns for the Thunderstone Era. The trilogy will provide the most epic saga in the Thunderstone timeline, and attempt to showcase many key plot elements and factions. Thunderstone will use a versioning system that is designed to help users of the era. The version will be contain three numbers (e.g. 0.1.1). The first number is the major milestone (see roadmap below). The second number indicates incompatible releases, and users cannot play multiplayer between these versions. Content designed to use Thunderstone might also use features not found in previous versions and thus it is recommended to update when a new incompatible release is released. The third number indicates compatible releases. This means that content for Thunderstone and MP games using Thunderstone will still work with each other. Someone with 0.1.1 could play with someone else who used 0.1.0. Major Release Roadmap: What is needed for...? Unit WML: every faction's units; non-buggy playing; balance not guaranteed. Extra features (terrain, items, other units, etc.) for everything planned are all included. Extra features (terrain, items, other units, etc.) are mostly polished. The two additional add-ons are released. Other official add-ons also completed and also at 1.0. On par with, or close to, Default Era and mainline. Please note that Thunderstone, like all add-ons, goes in data/add-ons/ in the Wesnoth userdata directory. The repository version tends to be unstable and is generally not compatible with a release of Thunderstone on the add-ons server, so use it with caution and do not expect to be able to use it for multiplayer. If you would like to help with Thunderstone, you can coordinate on the #wesnoth-thunderstone IRC channel (for real-time chat and to keep updated on the repository revisions) and in our forum threads for general discussion and art. A forum thread for general discussion will be released as soon as Thunderstone is officially published on the add-ons server. Until then, IRC is a suitable place for communication. Thunderstone art is used to keep track of what art is needed and what art is done. This page was last edited on 21 March 2013, at 03:26.